David Sadler worked for Contessa yachts, building and designing them in 1969. However, in 1974 he broke loose from Contessa and started designing “Sadler yachts” with his Son Martin. They used what they had learned from Contessa and came up with the popular Sadler 25 of which fast became a very popular boat. At the time Sadler were one of the biggest boat manufactures in the UK, going on to make the Sadler 33, 29 and 34. Sadler have the reputation for quality, fast and unsinkable designs that have stood the test of time. They went on to develop Starlight yachts and of course the Barracuda 46 of which became the best cruising yacht ever. You can still have a brand new Sadler 32 built and designed today. History: The Sadler story started in 1969 with David Sadler designing and building the Contessa 26, with Jeremy Rogers. 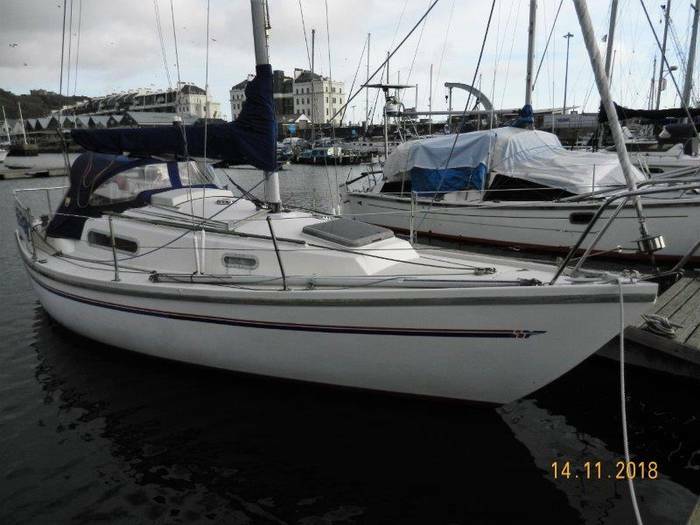 This was an evolution of the successful Folkboat design and a few years later, was followed by the Contessa 32. 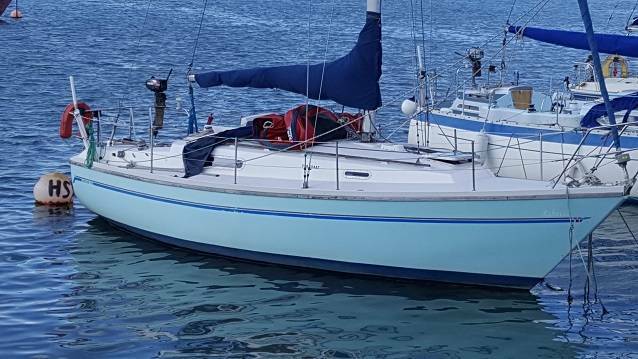 Following the success of the Contessa 26 and 32, David set up with his son Martin a small boat building operation in 1974, and their first boat was the Sadler 25. 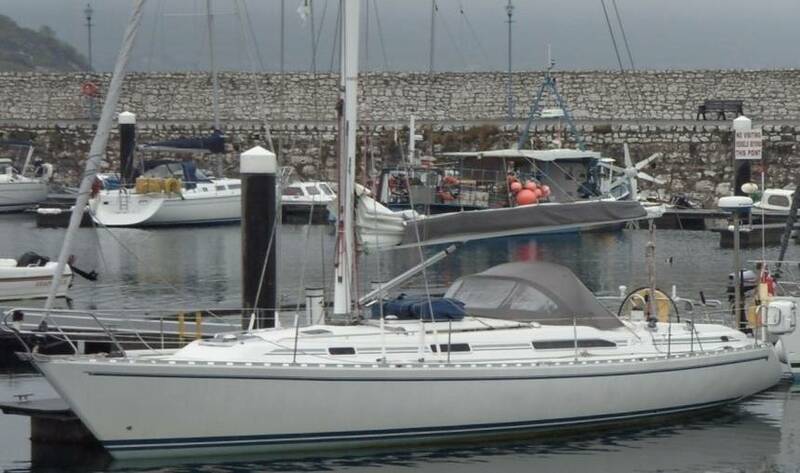 Following his experience with the very successful Contessa range, the 25 was the forerunner of the Sadler range of boats. The 25 quickly became popular as a club racing boat and had many successes in longer races such as Round Britain and Transatlantic. 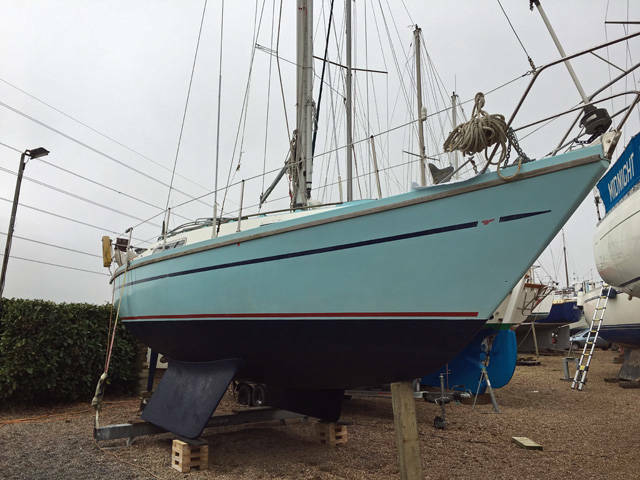 This was a tough boat for seagoing, had the latest fin keel and skeg configuration, was robustly constructed and provided a safe, small family cruiser with wide appeal. Some 300 were built between 1974 and 1981. The later 25s were generally better constructed with well laid out interior, with GRP sub-mouldings and a slightly taller rig, which made the yacht even more competitive. It was inevitable that David Sadler would extend his experience gained in the Contessa 32 into the Sadler range. This happened towards the end of 1979, when the Sadler 32 appeared and this was to be another success story. 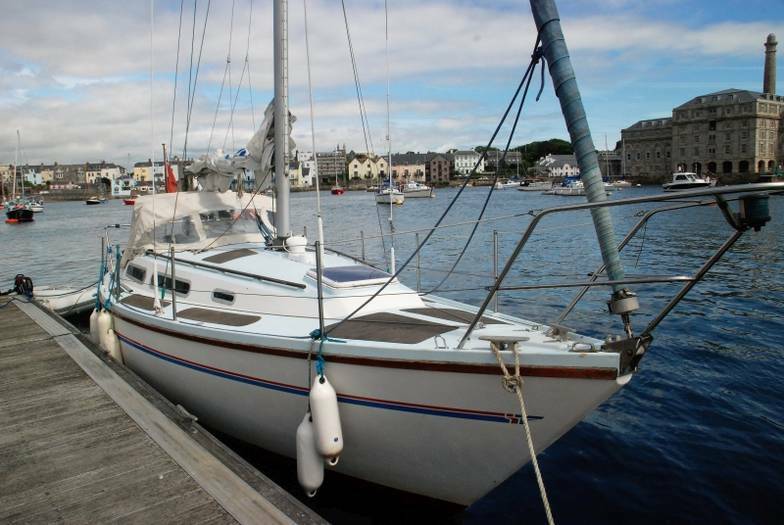 David built into the Sadler 32 a number of new desirable features which were considered lacking in the Contessa 32. The most important of these was a requirement for more accommodation, a stiffer yacht and one which would rate favourably under the current IOR rating rule. 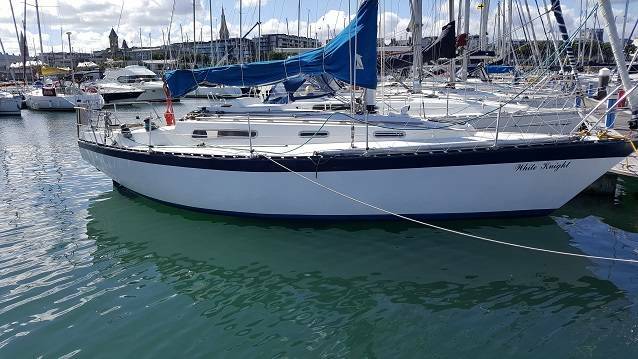 The result was the elegant Sadler 32, which received immediate enthusiastic acclaim from the yachting press and clearly possessed all the desirable attributes of the modern cruiser/racer. The boat was developed with a straighter sheer line, more beam, increased freeboard, cambered decks and this gave greatly improved interior accommodation. The canoe type stern and small transom provided for a smooth water flow and easy motion at sea. 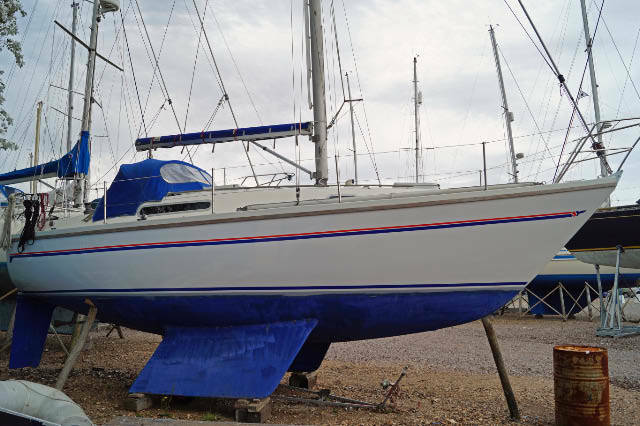 Just over 300 Sadler 32s were built between 1979 and 1989, when the moulds were purchased by Mike Slack on the East Coast, who went on to build about fourteen yachts. The moulds have now been bought by Andy Middleton (ex Sadler employee, telephone: 01202 631608), who is currently able to build new Sadler 32s to special order. Incidentally, he also has the Sadler 25 moulds and has built several of these boats for customers in the UK. There was a major mile stone, (the millstone came later!) in the history of Sadler, when Martin having completed a yacht building course at Southampton College, developed the desirable notion of unsinkability as being a key factor in the decision to buy a family cruising boat. 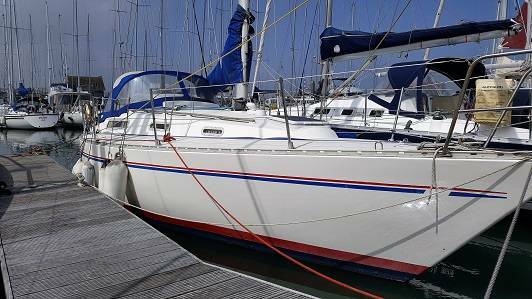 The unmistakable profile of the popular Sadler 29, followed quickly by the 26, came to the market in 1981. This was the boat which gained immediate acceptance as a family cruiser with standing headroom right through the cabins, separate toilet, dinette in main cabin and this wonderful feature of "unsinkability". The yacht was rendered unsinkable by bonding into the inside of the hull a completely separate interior moulding, which also provided for the galley, bunk bases, chart table module and all manner of features cleverly moulded in as an integral part of the hull structure. All the voids between the interior moulding and the hull were then filled with expanded polyurethane foam. This was inserted in liquid form and rapidly expanded to fill all the voids available. This foam was of "closed cell" construction, thus rendering it impervious to moisture. Water was unable to progress through the foam - unlike many other smaller unsinkable boats, where the foam absorbed moisture. Tests were in due course carried out on a Sadler 26, by opening all the seacocks whilst sailing off Poole in 22 to 25 knots of wind. 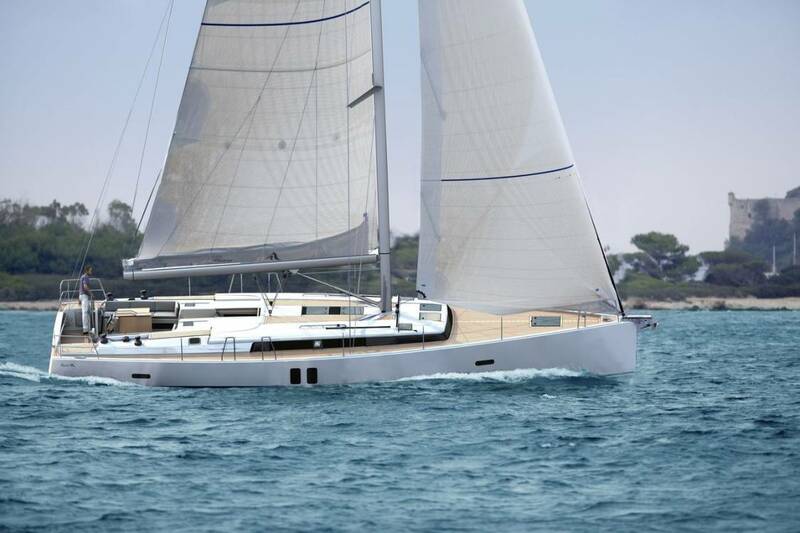 The results were dramatically impressive and written up in several yachting magazines, since the boat could continue to be sailed, with the natural water level only coming upto the bunk bases. In fact, as part of the test, the little yacht was overburdened with water from a remote fire pump, which initially made the motion a little "groggy". However, the boat went off sailing again and the water attained its natural level (just above bunk base) and finally sailed home. Nearly 400 Sadler 29s were built and about 200 Sadler 26s, so there are a fair number of Sadlers in service, giving owners this great feeling of security in the event of the unforeseen happening. A natural development of the unsinkable design was to progress towards a bigger yacht and the Sadler 34 came to prominence in 1983. Some 260 of these cruising yachts were built until they ceased production twelve years later in about 1995. Immediately popular with charter groups, sail training organisations and the Services, the Sadler 34 achieved many notable successes. Providing all the sturdiness and comfort of a larger cruising yacht, the 34 also had a fair turn of speed and excellent seagoing capability. With easy entry and a fair hull shape, the boat had a sea-kindly performance and provided an excellent motion at sea. 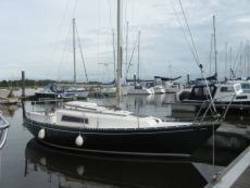 With full standing headroom right through, separate heads facility to one side of the companionway, separate aft cabin, substantial galley and a really comfortable main saloon, this yacht was widely acclaimed by the yachting press. Towards the end of the 1980s, Sadler was among the "big three" boat builders and they launched into the unusually styled Barracuda 46. This was a big step for Sadler, to develop a new yacht with many technical innovations such as lifting keel, twin rudders, shifting water ballast and other ideas which were well ahead of all the other boat builders. This of course led to exposure through the national media, particularly as a result of the television series "Howards Way", when the Barracuda became the best known cruising yacht ever. Sad to say, only 19 of these yachts were built and the "hype" associated with this boat and Howards Way, probably distracted senior management, to the extent that Sadler Yachts went into receivership in August 1988. Very quickly, the assets were bought by two businessmen, already successfully trading in the marine market and new money was injected into the business. Hallberg Rassy Company Base: Swedan Year of Formation: 1972 Market: Quality and bespoke yachts History: Harry Hallberg, who lived between 1914 and 1997, commenced his boatbuilding career as a juvenile of 14, by constructing boats made of wood. In 1943 he opened his own yard at Kungsviken on the island of Orust in Sweden. At first, he built his wooden boats more or less by instinct. Different possibilities were discussed with the customer and solutions pointed out. Blueprints hardly existed at all. It was said that: "Someone who cannot build a boat without drawings cannot call himself a real boat builder". The first boat to be built in a series was the Folkboat. He also had good success with Kungskryssaren (Swedish for the king’s cruiser), not to be confused with the Finnish King’s Cruiser which has nothing at all to do with Hallberg-Rassy. The Kungskryssaren was constructed in the mid-50’s. Both the Folkboat and Kungskryssaren was also built by other yards. Harry Hallberg’s most distinguished contribution was his understanding of the advantages of using GRP and to build boats in a series. In 1963 he was one of the pioneers in serial production of sailboats using GRP. He was the first successful builder of GRP hulls with wooden superstructure in a series. His P-28 was a great accomplishment and in many aspects a forerunner. Christoph Rassy was brought up in Bavaria in the south of Germany by a lake named Starnberger See. In his spare time he built models of boats and also real boats. He wanted to learn more about boats and became an apprentice at a small yard for wooden boats in southern Germany. Soon he wanted to build and sail larger and finer boats and wanted to live by the sea. He thought that Sweden, a large country with lots of water, was bound to build large and splendid boats. Consequently, he wrote to many Swedish boatyards, requesting work. One yard wrote that they would welcome him, and in 1962 Christoph moved empty-handed and with a bicycle as his only possession to Nötesund, Sweden to build boats. During the day he built boats for a boatyard that today since many years is out of business. To stretch his cash flow young Mr Rassy built boats for himself in his spare time. He raced these boats, won, and sold them at a profit. Soon Christoph Rassy wanted to strike out on his own. As luck had it, this coincided with a leading boat builder's change of premises. This boat builder was Harry Hallberg.In the mid-60’s the yard at Kungsviken had become too small for Mr Hallberg and he built new premises in Ellös, 10 kilometres to the southwest on the island of Orust. When Christoph Rassy started his own business he bought the old Hallberg yard in Kungsviken. designed in 1966 by the then leading Swedish designer of elegant yachts, Olle Enderlein. The first two were built entirely in mahogany and took one year each to construct. This boat was in many ways ahead of its time. It was a pioneer long distance cruiser with a powerful engine and a centre cockpit protected by a windshield. This is a design that has remained with the Hallberg-Rassy yachts to this day. When the Rasmus was presented many eye-brows were raised. Some thought that the boat was much too large. In those days 35 feet was regarded as an enormous boat size. In addition, it was a sailing boat with a windshield. This was a combination never seen before. Today it is taken for granted on a good cruising boat. At the same time Harry Hallberg built his boats in Ellös. 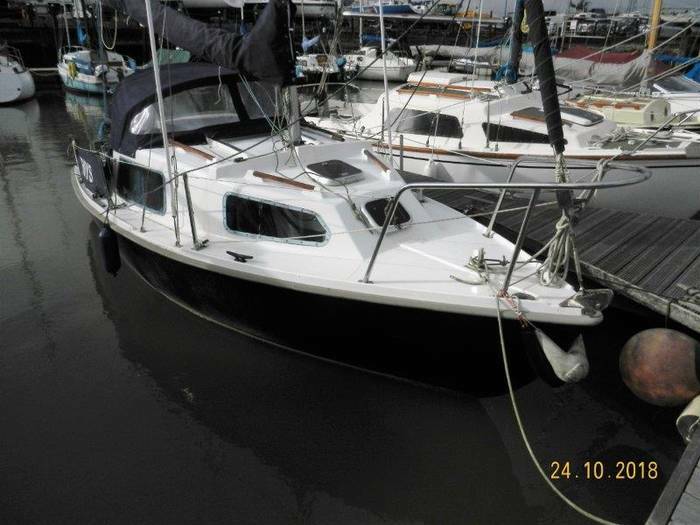 Smart, attractive boats at a reasonable price, thanks to serial production and a GRP hull. Harry Hallberg retired in 1972. Again, fate intervened; Christoph Rassy was looking for larger premises. Ellös now produced the "Mistral 33" featuring a superstructure of mahogany, the 1/2 ton "Mistress 32", the best-selling "P-28" and the little yellow "Misil 24", all designed by Olle Enderlein, with the exception of the P-28 which was designed by Harry Hallberg. In 1972 the Rassy yard in Kungsviken purchased Harry Hallberg’s yard in Ellös. As the Hallberg brand was by far the most well-known with its four designs and the Rassy yard only had the Rasmus; the new company was named Hallberg-Rassy. Harry Hallberg and Christoph Rassy, however, have never been partners.